Photograph of a lost painting of a street view. Date unknown, possibly pre-war. Hand-written on back are 2 pencilled addresses in Paris: “6, rue du Puits de l’Ermite” and “Impasse du Rouet 29” and the name “Fabjansson”. Yad Vashem Photo Archives, 7950/14. 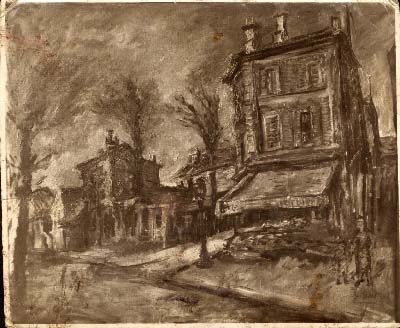 Gift of Tobias Rozynès, Lyon, via Gérard Mayer.